Call reminding:Ring tones and vibrate. See Text, call and other APP notifications directly from your V8 smartwatch via Bluetooth connection to your smartphone. Precisely record your sporting data, monitor and help you manage your health quality, monitoring how well you sleep last night, help you find your cellphone when lost it. Will NOT work with 3G only providers like ATT, Will NOT work with any CDMA Carriers such as Verizon, Sprint, Boost, PagePlus etc. Call reminding:Ring tones and vibrate. Bands: GSM 850/900/1800/1900MHz Quad-band calling. PadgeNE Smart Watch. Sleep monitor. Sounder recorder. Image viewer. Audio player. File manager. 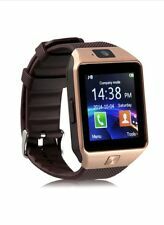 1x DZ09 smart watch. - Bluetooth Dialer, Call Reminder, Bluetooth Call. This watch is Bluetooth 3.0. All functions support android 4.3 and up smart phones. - 1x User Manual. - 1x USB Cable. CPU: MTK6260A 533MHz. Manufacturer: Padgene. Bluetooth Version: Bluetooth V3.0 EDR. - Play the music in your phone (after Bluetooth paring). 1 x Bluetooth Smart Watch. Bluetooth Protocol: A2DP HFP 1.5 HS P 1.2. - Anti-lost alarm function: When cellphone left watch alarm automatically, after a certain distance to avoid lose the phones. Bluetooth Dialer, Call Reminder, Bluetooth Call. This watch is Bluetooth 3.0. All functions support android 4.3 and up smart phones. - 1x DZ09 smart watch. - Calendar (Synchronizable). Gravity Sensor: Support. Reloj Inteligente Android Relojes De Hombre Regalos,Para Caballero Deportivos..
💟 [Wide Compatibility & Stable Connection]: Topffy smart Watch adopt Bluetooth V4.0 technology to connect your phone. And this smart watch is fully compatible with all Android phones and Apple IOS phones on the market. Sync phone book / SMS / call history (only for android phone). 1 x Bluetooth Smart Watch. - Anti-lost alarm function: When cellphone left watch alarm automatically, after a certain distance to avoid lose the phones. Compatible with Android and Apple phones. Padgene DZ09 Bluetooth Smart Watch with Camera By Padgene NEW reloj. Condition is New. Shipped with USPS First Class Package. New, unused, in the original box Smart Watch Phone for use with the Android Phone. New and in original box. Includes instructions, cord, and watch. Padgene Bluetooth 4.0 Smart Watch Bracelet for Samsung S5 Note 2 / 3 / 4, Nexus 6, Htc, Sony and Other Android Smartphones Parent. Connects to phone with Bluetooth. I has a speaker (so you should avoid getting it wet). It's pretty loud, but doesn't have the best sound. Includes Smart Watch, charging cable (no wall plug adapter), box, and instructions. Padgene DZ09 Bluetooth Smart Watch 【Bluetooth Phone Calling】If you don't have a micro sim card, you can also make phone calls after you connect your watch to your Android smart phone via Bluetooth. Will NOT work with 3G only providers like ATT, Will NOT work with any CDMA Carriers such as Verizon, Sprint, Boost, PagePlus etc. We stand behind our products. width: 0 x height: 0 x length: 0 x weight: 0. Calendar:sync schedule. Clock Display: 3 sets the clock display, free to switch. Call reminding:Ring tones and vibrate. Will NOT work with 3G only providers like ATT, Will NOT work with any CDMA Carriers such as Verizon, Sprint, Boost, PagePlus etc. Bands: GSM 850/900/1800/1900MHz Quad-band calling. Precisely record your sporting data, monitor and help you manage your health quality, monitoring how well you sleep last night, help you find your cellphone when lost it. Precisely record your sporting data, monitor and help you manage your health quality, monitoring how well you sleep last night, help you find your cellphone when lost it. See Text, call and other APP notifications directly from your V8 smartwatch via Bluetooth connection to your smartphone. You can order either a white band and watch, black band silver watch, black band gold watch, black band and watch, white band gold watch, black band gold watch, or rose gold.Works for basically every smart phone. 【Bluetooth Phone Calling】If you don't have a micro sim card, you can also make phone calls after you connect your watch to your Android smart phone via Bluetooth. Padgene DZ09 Bluetooth Smart Watch. We do not accept P.O. Boxes. Id=com.szkct.weloopbtnotifition.main App not support ISO Read more Read more. Phone function: Make phone call directly from the smart watch,including answering and dial-up. SIM slot,support make calls by Bluetooth or smart watch. Padgene DZ09 Bluetooth Smart Watch. Bluetooth Dialer, Call Reminder, Bluetooth Phone Calling. Bluetooth Music?. Phone function: Make phone call directly from the smart watch,including answering and dial-up. Will NOT work with 3G only providers like ATT, Will NOT work with any CDMA Carriers such as Verizon, Sprint, Boost, PagePlus etc. Precisely record your sporting data, monitor and help you manage your health quality, monitoring how well you sleep last night, help you find your cellphone when lost it. Bluetooth: Bluetooth 3.0. SIM slot,support make calls by Bluetooth or smart watch. Phone function: GSM/GPRS 850/900/1800/1900(2G); Call,hand free,call record,phone book;Bluetooth phone call Image viewer, Sound recorder, Audio player(need put and SD card ). Call reminding:Ring tones and vibrate. Precisely record your sporting data, monitor and help you manage your health quality, monitoring how well you sleep last night, help you find your cellphone when lost it. 5D Radian Capacitive Touch Screen for easy operation. Built-in SIM card slot and TF card slot. - Maximum compatibility. All Android Smartphones and Android Tablet PC. Such as Samsung, HTC, Sony, LG, HUAWEI, ZTE, OPPO, XIAOMI, and so on. (Apple system can' t sync SMS and Bluetooth push information, but other functions can be used by iPhone); Android Tablet PC: Samsung, Nexus, Onda, Newsmy, and so on. Product is OPEN BOX - NEW. SOLD AS IS - No warranty. SIM Card: Single SIM Card (Micro SIM Card) Can be as a phone. You can use it with or without smartphone. Install GSM 2G SIM card, it can be use as a phone. It says it all. We stand behind our products. Bluetooth Dialer, Call Reminder, Bluetooth Phone Calling. Bluetooth Phone CallingIf you don't have a micro sim card, you can also make phone calls after you connect your watch to your Android smart phone via Bluetooth. Multi function. Maximum compatibility. All Android Smartphones and Android Tablet PC. Such as Samsung, HTC, Sony, LG, HUAWEI, ZTE, OPPO, XIAOMI, and so on. Android Tablet PC: Samsung, Nexus, Onda, Newsmy, and so on. Trending at $18.95eBay determines this price through a machine learned model of the product's sale prices within the last 90 days. Will NOT work with 3G only providers like ATT, Will NOT work with any CDMA Carriers such as Verizon, Sprint, Boost, PagePlus etc. Trending at $19.37eBay determines this price through a machine learned model of the product's sale prices within the last 90 days. Bluetooth Phone CallingIf you don't have a micro sim card, you can also make phone calls after you connect your watch to your Android smart phone via Bluetooth. Watch Phone Install an unlocked Micro sim card after you open the back cover to make Phone calls, GSM bands 850/900/1800/1900MHz.